You can change the font you are using on your website at any time. Create provides a selection of web safe fonts which will work across a range of browsers, operating systems and devices. If you are using the Create Design Studio, please follow the instructions below to choose your website fonts. Click on "Design" on the left menu and the left-hand panel pops out. Icon Font - If you have icons displaying either in the top right corner of the template or if you are using the Website Footer Creator. Click on the font type you want to change, then click on the font you would like to change to in this section. You'll see it update in the website preview. Once you've chosen the font you like, click the green "OK" button at the top of the screen to select it. Repeat steps 6 and 7 for the other fonts you want to change. How do I change my heading size? What fonts should I use with my website? Certain fonts can appear smaller and harder to read on screen than others. The more decorative font types are generally better suited when used sparingly for things like large headings. The best fonts to use for the main text on your site are modern fonts such as Arial, Tahoma, Trebuchet or Verdana. These will be much clearer for your visitors to read, as they were designed for use on computer screens. Can I Use Other Fonts / Typefaces? We are looking into ways of allowing the use of other fonts but unfortunately, those that are currently available are the only ones that you can guarantee all of your users will see correctly. If a visitor comes to your website and does not have the same font that you used installed on their own computer then they will not see your site as you intended. Why is my default font colour or font style not changing? 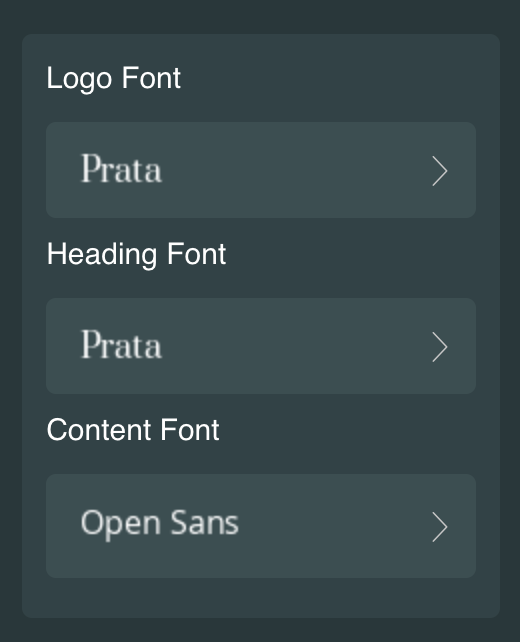 If you have changed your default font colour or style of font in "Design" and some of the text on your pages have not changed, it will most likely be that you have already changed that text in the editor. Once you have changed the text in the editor and saved it, you will need to go back to "edit" the page to change the text again. If you would like the text to be in the default colour or style you have set in "Design", then you can highlight the text and click on the "Remove formatting" icon on the top toolbar which looks like a white rubber. This will undo any changes you have previously made on the text. You may need to click on the icon several times to undo all of the stages.